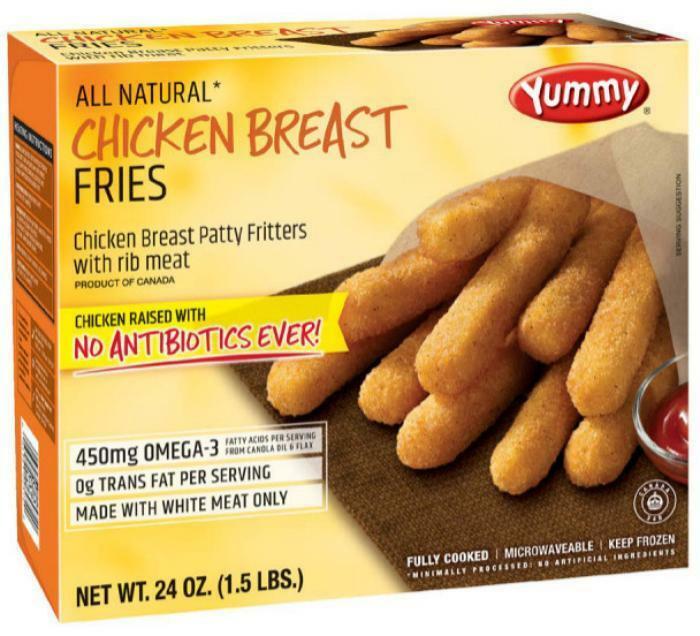 Maxi Canada of Quebec, Canada, is recalling an undetermined amount of breaded chicken products that may contain milk, an allergen not declared on the label. 26-oz. boxes containing Yummy brand “100% ALL NATURAL CHICKEN BREAST FRIES WITH WHOLE GRAIN Breading CHICKEN BREAST PATTY FRITTERS WITH RIB MEAT,” with barcode 064563223160 printed on the box, and lot numbers 170109, 170581, 161657, 170087, 170279, 170490, 170513, 170628, 161486 and 161396 printed on the internal bag. 61-oz. boxes containing Yummy brand “Chicken Breast Nuggets Nugget-Shaped Chicken Breast Patty Fritters with Rib Meat 100% All Natural,” with barcode 064563225027 printed on the box, and lot numbers 170618, 170858, 170058, 170161, 170301, 170322 and 170011 printed on the internal bag. 26-oz. boxes containing Yummy brand “CHICKEN BREAST NUGGETS NUGGET-SHAPED CHICKEN BREAST PATTY FRITTERS WITH RIB MEAT 100% All Natural,” with barcode 064563225720 printed on the box, and lot numbers 161545, 161624, 170057, 170192, 161632 and 161391 printed on the internal bag. 38-oz. boxes containing Yummy brand “Chicken Breast Nuggets Nugget-Shaped Chicken Breast Patty Fritters with Rib Meat 100% All Natural,” with barcode 064563225782 printed on the box, and lot codes 170128 and 161528 printed on the internal bag. 38-oz. boxes containing Yummy brand “Yummy! Yummy! Alpha Buddies Chicken Breast Nuggets Chicken Breast Patty Fritters with Rib Meat,” with barcode 064563227915 printed on the box, and lot numbers 170488, 161131, 170306, 161567, 170062, 170388, 170476, 170535, 161403, 170543, 161578, 170123, 161547, 170243 and 161110 printed on the internal bag. 80-oz. boxes containing Yummy brand “Yummy! Yummy! Dino Buddies Chicken Breast Nuggets Dinosaur-Shaped Chicken Breast Patty Fritters with Rib Meat 100% All Natural,” with barcode 064563226574 printed on the box, and lot numbers 170284, 170421, 170422, 170437, 170025, 170330, 170449, 170594, 170601, 161614, 161494, 160774, 161418, 170094, 170008, 170054, 170113, 170053, 170101, 170167, 170112, 170710, 161563, 170559, 161018, 170164 and 170427 printed on the internal bag. 61-oz. boxes containing Yummy brand “Yummy! Yummy! Dino Buddies Chicken Breast Nuggets Dinosaur-Shaped Chicken Breast Patty Fritters with Rib Meat 100% All Natural,” with barcode 064563226406 printed on the box, and lot numbers 161248, 170176, 161248, 170028, 170176, 170213, 170462, 170497, 170408 and 170280 printed on the internal bag. 24-oz. boxes containing Yummy brand “Yummy! Yummy! Dino Buddies Chicken Breast Nuggets Dinosaur-Shaped Chicken Breast Patty Fritters with Rib Meat 100% All Natural,” with barcode 064563226536 printed on the box, and lot numbers 170183, 161484, 161621, 161633, 170015, 70556, 161292, 170417 and 170161 printed on the internal bag. 80-oz. boxes containing Yummy brand “Yummy! Yummy! Dino Buddies Chicken Breast Nuggets Dinosaur-Shaped Chicken Breast Patty Fritters with Rib Meat,” with barcode 064563226635 printed on the box, and lot numbers 161415, 161566, 170031, 170194, 161036 and 161400 printed on the internal bag. 42-oz. boxes containing Yummy brand “Yummy! Yummy! Dino Buddies Chicken Breast Nuggets Dinosaur-Shaped Chicken Breast Patty Fritters with Rib Meat,” with barcode 064563226079 printed on the box, and lot codes 170308, 170384, 161555, 170005, 170029, 170080, 170477, 170119, 170202, 170290, 170391, 170374, 161333, 161399, 161457, 170033, 161026, 161290, 170007, 170129, 170225, 170304, 170220, 170456, 170199, 160790, 161413, 170410, 170159, 161294, 161595, 161020, 161024, 161322, 170143, 170201, 161065, 170117 and 170324 printed on the internal bag. The recalled products, bearing establishment number “348” inside the Canadian Food Inspection Agency (CFIA) mark of inspection, were shipped to retail locations nationwide. Consumers with questions about the recall may contact Chantal Jacques at (450) 439-9616.